Stylish yet simple, our handcrafted Richmond Bed offers a quaint Mission-inspired style with a modern look that is versatile enough to stand as the centerpiece to any bedroom suite. The bold arches in the headboard, connected to the elegantly splayed legs, encase the classic slat design that provide the backdrop to the entire piece. One each side, two thick, solid wood slats are connected to a low footboard, joined together by a solid slat system to ensure a stable platform for your mattress and box spring and a lifetime of consistent service. 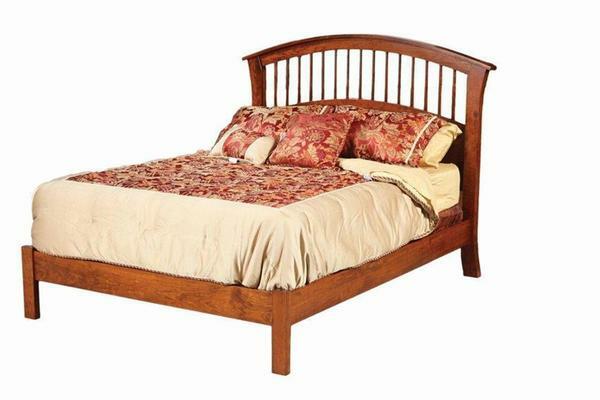 Customize this beautiful bed to fit any bedroom suite. Available in all standard sizes, from Twin to California King, you're sure to find the right bed to fir your available space. Next, choose from seven different hardwoods, each one with an array of vibrant stains, to ensure the perfect combination to complement the rest of the home. Finish it up with a matte or semi-gloss varnish to seal in the beauty and your new bed will be handcrafted, just for you. Headboard Height - 57 3/4"
Footboard Height - 14 3/4"